Wednesday, September 30th 9PM Cinéma du Parc 21h, mercredi le 30 septembre. Support the Festival! Buy Tickets or DVDs! Listen to This by/par Itay Sasson, Jennifer Sarkar, Gilli Tohar, Mirna Yacoub and Abu Abara, Canada, Palestine and Israel. Two musicians practicing in adjoining rooms have a musical battle. Winner of the YoungCuts/Directors of Change Frame It to Change It Contest: Dreams Beyond the Border by/par Jessica Szeto, Canada. The Child of the World by/par Ho Rui An, Singapore. Devastated bu the death of his mother, Kevin creates an imaginary guardian with the ability to materialize Utopia. What'd ya want, a happy ending? by/par Kyle Kleinbart, USA. Love eludes a lonely young man. Is the red balloon the key? Roadrunner by/par Zac Wong, USA. A bored young suburbanite dreams of shaking through the streets, using only her shoes. It Only Takes One by/par Gabe Benjamin, Nick Lieberman, Emily Firestein and Timmy Weston, USA. One person can think about their environment and make a difference in their world. Sparks in the Night by/par Ben Kadie, USA. Detective Leon Sparks closes in on notorious lawbreaker Jerry Walker. Birthmarks by/par Phil Hamilton, USA. Jacob leads Kyle to believe that a household microwave holds the key to unleashing his unique identity. Blackspot Culture by/par Wayne Robinson, Canada. An investigation into the Blackspot anti-corporation and its' newest venture: the Blackspot sneaker. Stickies and Stones by/par Helen Wong, Bernadette Che and Narissa Shivji, Canada. Every seven minuutes someone is bullied mentally or physically. One Less Shamrock by/par Nick Kelly, Canada. An Irish immigrant struggles to gain control of his life and uphold his family values in the New York depression. HUSH by/par Jauvonnie Brown, USA. Four high school students - Four problems. Do they tell their secrets or keep it on the hush?HUSH by/par Jauvonnie Brown, USA. Four high school students - Four problems. Do they tell their secrets or keep it on the hush? Silent Scream by/par Foundation for the Preservation of Wild Life and Cultural Assets in Armenia, Armenia. Youth filmmakers document animal abuse in Armenia. Growing Up in India by/par Marc-André Boucher, Sarah Chartrand, Caitlin Chartrand, Florence Fortin-Brunet, Stéfanie Gauthier, Alexandra Hartnell-Godin, Taylor Herrington, Emilie Johnsson, Jenna Monney-Lupert, Laurent Malo, Alexandre Oakes-Câmara, Nathaniel Q, Julie Paquette, Julia Rogers, Kendra Veigh Ryan, Olivia Sheehy-Gennarelli, Michelle Vanderzon, Padmaja Gungun, Rohit Janegar and Mulkesh Nath. In the spring of 2009, a team of high school students traveled to Udaipur in the Northeastern desert state of Rajasthan in India to document personal stories and struggles of young people growing up in India. Tuesday, September 29th 9PM Cinéma du Parc 21h, mardi le 29 septembre. Vigilante by/par Mitchell Arend, Canada. A costumed crime-fighter reflects on his career choice with a TV news crew. Duplicate Complicate by by Peter Ian Mancao, Philippines. One twin pushes the limits of outdoing the other to get the girl he likes. The following films in this screening are short-listed for the Mirror Weekly Best Short Shorts Award. Passé Composé by Alexandre Lynn and Mathieu Grimard, Canada. Félix tente de reconstituer les éléments d'hier. Il fait face à lui-même lorsqu'il apprend la mort de sa mère. Felix tries to piece together his memories of the day before. To his surprise, he confronts himself when he learns of the death of his mother. The Kill by Joe Vea, USA. The boyfriend finds his love slain and seeks to avenge her killer. Alien Abduction by David Han, USA. A hungry alien tries to bring home a bull to cook and eat. Jalouse by Melanie Delloye, France/USA. As she watches her mother and brother play, a jealous little girl sits by herself on a swing. 1271 by Michael Warczak, Australia. Have you found Jesus yet? Breathless by Kyle Sandilands, Canada. A man reflects on his destructive actions after vowing to avenge his girlfriend's death. Swipe by Max Blustin, UK. A request to borrow some money brings about unexpected consequences. The Reel Man by Kieran Heilbron, Canada. A short film about a man, a hat and a fishing rod. Dogface by Shai Halfon, USA. A world War II soldier, suffering from combat stress, sits alone in his foxhole behind enemy lines. Cogency by Tyler Knell, USA. After her husband locks himself in the bathroom and does not respond, a woman calls the police and explains the events leading to his death. Le Cou Cou by Zed Bennett Jr., USA. The interaction between a shop owner and a malfunctioning cuckoo clock. Layang-Layang (Kites) by Agnes G. Wiguna, Canada. A childhood story about a boy who wants to catch the clouds. Tah-Dah by Stacey Chomiak, Canada/USA. One bug. One farmer. And the cello that brought them together. Estigia (Styx) by Claudette Montero, Argentina/USA. They say that witchcraft does not exist but we must never forget the capacity of hatred and another human being. Mala Smrt (Little Death) by Claiborne McDonald, Czech Republic/USA. The sexual exploits of a teenage girl manifest their consequences in the death of her father. Static by Jack Lykins, USA. Doll Call by Sanabel Almomani, Chris Gonzalez and Yesenia Deleon, USA. What happens when the forces of evil are awakened and a doll becomes a mechanical killer? Joyeux Festin by Sara Dupéré, Canada. Orgie sanglante de sauce à "spag" sur un lit de vidanges. A holiday feast of spaghetti sauce on a litter of garbage. Monday, September 28th 9PM Cinéma du Parc 21h Lundi le 28 septembre. Films in this screening are short-listed for the MyFilmmaker.com Best Actress Award. 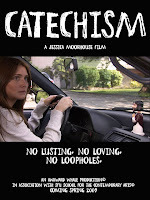 Catechism by Jessica Moorhouse, Canada A quirky comedy about love, lust and doing the right thing, all while trying to avoid the burning depths of hell. Scarecrow by Sarah Blevins, Canada Transcending the shadow of looming death cast by leukemia, an eight-year-old escapes into a ripe realm of abundance and freedom. A Sister's Love by Christopher Mitchell, USA A young woman is struggling to cope with her mentally ill sister. Tucker by Zia Marashi, Canada A comedy about a teen mother who must care for a rapidly aging child who has an agenda of his own. 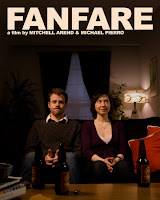 Fanfare by Mitchell Arend and Michael Pierro, Canada A confident young lady meets a kinda cute young guy for dinner and embarks on the journey that is a first date. Lily by Claire Sanford, Canada An exploration of guilt and grief through environmental sound, rhythm and the emergence of music. Nel Reinu by Victor Suarez, Spain Following the death of his father a man returns to the home he ran away from thirty years ago. If Key-Lime Pie Could Scream by Amanda Fahey, Canada Devastated by a recent break-up, a woman starts the latest fad diet. Batter Up by Josh Webber, Canada Family film based on a true story. Sunday, September 27th 9PM Cinéma du Parc 21h dimanche le 27 septembre. Films in this screening are short-listed for the Tribute.ca Best Actor Award. Paper Princes, Gypsies and the Boy With No Return Address by/par Celeste Koon, Canada. The world of Liam, an eccentric 10 year-old. 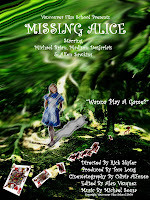 Missing Alice by/par Rick Skyler, Canada. A delusional man revisits his childhood friend in Wonderland only to uncover the awful thruth that changed his life. Flamingo by/par Mike Harris, USA. Tempted by the affections of an attractive waitress, Ramses finds himself torn between his own interests and those of his eccentric best friend. Ellipsis by/par Adam Justice, UK. The powerful emotions in relationships come together with a bang for one man. Allegro Compreso by/par Enrico Maria Artale, Italy. A young composer tries to live on his own, he realizes that it's not easy at all. Nødutgang (Emergency Exit) by/par Tomas Solli, Norway. A young man is taken hostage. Both him and the robber must solve their problems before time runs out. The Drifter by/par Craig Calamis, USA. A newly engaged couple find themselves in the wrong place at the wrong time. Maia and Jonah by/par Michael McLaughlin, Canada. A young defined girl meets a socially awkward boy and the offbeat romance that ensues brings past memories. The King's Receipt by/par Peter Pa and Matthew Feener, USA. The ruler of a lonely kingdom sends his sole subject, a jester, on a diplomatic mission. Sunday, September 27th 3PM Cinéma du Parc 15h dimanche le 27 septembre. Films in this screening are short-listed for the Virgin96 Best Music Award and the MyFilmmaker.com Best Animation Award. Jambalaya by Audrey St-Auneauld (Canada) A young man is resting when he is suddenly interrupted by a young woman playing the trumpet. We Are All Here by Yong Hwa Choi (USA) We are all living on the Earth. We are all using the resources of the Earth and its' energy. Freedom by Jeremy Izso, Mohammed Qassas and Illy Auerbach (Canada/Palestine/Israël) Hand-drawn paintings and meticulously rendered rotoscope images bled to create a poetic meditation on freedom. Yea by Adam Newman (USA) A typical love story, except that someone falls off a cliff instead of in love. Swan Song by Dillon Novak (USA) We are taken along a story of lost love and closure. Electric Rivers by Esteban Vargas (Canada) Winner of the Montreal Fringe Festival film contest. And Some Days It Rains by William Frazier (USA) A mayfly only lives for one day, and sometimes that day can be a pretty bad one. Remue-Ménage by Julie Bernier (Canada) Spring cleaning shows the stresses and strengths of a long-time married couple's relationship. Infeccion by Viktoriya Gruzdyn (USA) The host gets infected by a foreign species, this interference leads to chronic wounds and even death. I Will for it Rain by David Barlow-Krelina (Canada) A man sits alone in his apartment watching the streets below. He describes the changes in his life. Only Human by Caroline de Koninck (Canada) If you were to see a lost dog stranded on the road, would you stop to help it? Sweet Little Bird by Ashley McKenzie (Canada) Cape Breton rocker Carmen Townsend and her band-mates reveal their softer side in this music video. Mask of Pretension by Sheldon Pearson (Canada) Music video produced entirely by students at the Art Institute of Vancouver. Thorns by Nitzan Rotschild (USA) A man is haunted by the memory of his past lover while a seductive woman spends the evening with him. Token Hunchback by Timothy Reckart (USA) A stop-motion mockumentary about an actor with a hunchback and his struggle against typecasting. Le Pardon by Eleonore Goldberg (Canada) A man comes back to his home. The woman he loves ignores him. To be forgiven, he will shave his beard. Meltdown by David Green (USA) Fridge leftovers fight for their lives when an invading block of ice threatens to absorb them all into its' frozen mass. The Diary by Benjamin Lussier (Canada) Eric, a young American worker, is moving to Montreal. He tells the story of his immigration process. Saturday, September 26th 9PM Cinéma du Parc 21h samedi le 26 septembre. Films in this screening are short-listed for the En Primeur Best Cinematography Award and the MyFilmmaker.com Best Editing Award. Retiring Clean by/par Caillie West, Canada. A grumpy janitor gains a new appreciation for life after meeting with the ghost of his former self. Pushing Buttons by/par Quinn Cagney, USA. Breaking news sweeps the nation: tycoon billionaire Windsor Van Gold has been murdered! A Very Merry Christmas by/par Jonathon Gittus, Australia. Tragic comedy focusing on a fattening aging man working as a Santa Claus in the lead-up to Christmas. Sasquatch by/par Fahim Kassam, Canada. Greg tries to write an original commercial idea at his cabin while being stalked by an egotistical Ranger and a Sasquatch. Foreign Soil by Mazi Khalighi, Canada. The Taheri family has just handed in Canada, but their arrival starts off on the wrong foot. Macabre Muse by/par Daniel Devine, USA. An art student, struggling to find inspiration, turns to professional killing to jump-start his stagnated creativity. The Bridge by/par Sheldon Schwartz, USA. A Japanese-American soldier serving in World War II joins a squad of Caucasian soldiers on a dangerous patrol in Nazi-occupied Italy. The Peace Offering by/par Brandon Tom, Canada. Yvette Jacobs' family is torn apart when her husband Ken's former colonel asks him to end the war through self-sacrifice. A Clean, Well-Lighted Place by/par Joe Ciaravino, Canada. An old waiter struggles to find a sense of meaning and dignity in his life amidst a world that is seemingly "full of nothing". (one) by/par Benjamin Bee Stevens, UK. A lonely man is offered an unexpected chance to free himself from his misery. Saturday, September 26th 3PM Cinéma du Parc 15h samedi le 26 septembre. Films in this screening are short-listed for the High Fidelity HDTV Best Documentary Award. Imagine-éducation by/par the youth of the Third Avenue Resource Centre. (Canada) A look at the challenges of education as imagined by youth. Bike Trials: Regaining Balance by/par Sheldon Pearson. (Canada) The film follows the efforts of some North America's top trials riders through the course of their 2008 riding season. City Birds by/par Esteban Vargas. (Canada) Experimental look inside the world of contemporary dance through the use of cityscape and new age music. Injection Supervisée by/par Hugo Le Bleu-Tadros. (Canada) Documentaire sur les sites d'injections supervisées. Simple Destruction by/par Michael Greene. (USA) A short film about disease of addiction, viewed through the eyes of those truly affected by such a destructive sickness. Fashionably Green by/par Esther Viragh. (Canada) This film explores a different kind of recycling. Upcycling is the process of taking the old and transforming it into something new. Ce film explore une autre forme de recyclage. L’Upcycling est un processus où on prend de vieux matériaux afin de les transformer en quelques choses de nouveaux. No Sana Hoy: It Will Not Heal Today by/par Becky Korman. (USA) In coming to terms with losing my grandmother to Alzheimer's I journeyed to Cuba to connect with the life she no longer remembers. Field of Honour by/par Alexander B. Hill. (USA) A contemporary analysis of pistol dueling in the eighteenth century. Keeping the Bees by/par Pearl Ball-Harding. (Canada) A documentary investigating the mysterious disappearance of North American honey bees. Baby Blue by/par Maranatha Hay. (Egypt/USA) Baby Blue is the story of Roukaia, a two year-old born with congenital heart disease in Alexandria, Egypt. Friday, September 25th 9PM Cinéma du Parc 21h vendredi le 25 septembre. Films in this screening are short-listed for the iCi Best Quebec Film Award. Van Horne by/par Eric Piccoli Two mysterious men argue about the death of a young men under the Van Horne bridge. Hummingbird by/par Michael Wexler Sometimes a moment is just that. Gourgandine by/par Sebastien Landry A story about a couple in their early twenties struggling to make ends meet. L'Homme Boreal by/par Francois Laurent Dans le Québec du début des années 50, deux vieux amis se retrouvent et règlent leurs comptes. In early 1950s Québec, two old friends reunite and resolve long-buried issues. Overdue by/par Victoria Byron, Tommy Malone, Eric Padan, and Emilie Timmons. Toiling away, deep within the stacks, Larry the Librarian has a revelation. Travaillant dur, éloigné dans les rayonnages, Larry le bibliothécaire a une révélation. Natural Selection by/par A. J. Korkidakis A twisted tale of an old man who learns he can't outwit stupidity. L'excentrique vieux inventeur William Willoughby apprends qu'on ne peut pas être plus futé que la stupidité, et que la sélection naturelle est parfois plus embêtant que l'on voudrait. PURG by Daniel Kay Life after death isn't a right; it's a privilege. In & Out by Ian Ellemo Gerry's first day at Chico's Restaurant. Gerry et son première journée au Restaurant Chico. Dehors l'Hiver by Ismael Auray Après une journée routinière, Philippe découvre chez lui les traces d'un passé inachevé. After a routine day, Philippe discovers all around him traces of his failed ambitions. The Diary by Benjamin Lussier Eric, a young American worker, is moving to Montreal. He tells the story of his immigration process. YoungCuts selects 100 short films from the best young talent in the world! The 100 short films include entrants from Canada, the U.S., the United Kingdom, France, Australia, the Czech Republic, Spain, Egypt, Argentina, Singapore, India, the Philippines, Armenia and two short animated films co-produced by teens from Canada, Israel and Palestine. Two short previews for the YoungCuts Film Festival can be seen here and here. The Festival kicks off on Thursday, September 24th at Newtown with the High Fidelity HDTV Opening Gala hosted by Justin Trudeau, Member of Parliament for Papineau and Honorary Chairman for this year’s Festival. The charity gala will benefit The Cedars Cancer Institute. A Video Press Release with Justin Trudeau, Honorary President and Louise Kierans, President of the YoungCuts Film Festival can be seen here. During the Festival, prizes will be awarded for Best Actor, Best Actress, Best Editing, Best Cinematography, Best Animated Film, Best Original Music, Best Documentary, Best Short Short, Best of Quebec, Best Teen Film, Best Director, Best Film and the Tribute.ca Public Prize. Three films are already award winners having won contests to be featured in the Festival. Dreams Beyond the Border by Jessica Szeto is the winner of Free the Children’s Frame It to Change It contest; Electric Rivers by Esteban Vargas is the winner of the Montreal Fringe 500 contest and Vigilante by Mitchell Arend is the winner of the YoungCuts Repechage public vote. Founded in 2001 as the Toronto International Teen Film Festival, YoungCuts expanded to feature films from filmmakers 25 and under in 2004 and moved to Montreal to expand its selection of French and foreign films. This year marks the seventh edition of the Festival. The YoungCuts Film Festival is presented by MyFilmmaker.com and sponsored by Tribute, En Primeur, High Fidelity HDTV, Virgin Radio 96, ICI and Mirror. Come see the future of cinema! YoungCuts sélectionne 100 courts métrages parmi les meilleurs cinéastes émergents du monde! Parmi les 100 courts métrages retenu on compte des entrées en provenance du Canada, des Etats-Unis, de l’Angleterre, de la France, d’Australie, de la République Tchèque, d’Espagne, d’Égypte, d’Argentine, de la République de Singapour, d’Inde, des Philippines, d’Arménie ainsi que deux courts métrages d’animation coproduits par un groupe d’adolescents du Canada, d’Israël et de la Palestine. Deux courtes bandes annonces du festival peuvent être visioner ici et ici. Le festival débute avec le gala d’ouverture High Fidelity HDTV qui aura lieu au Newtown jeudi le 24 septembre. Justin Trudeau, membre du parlement de Papineau, en est l’hôte et de président d’honneur cette année. Le gala caritatif se fera au profit de L’Institut des Cèdres contre le cancer. Un communiqué de presse vidéo avec Justin Trudeau, président d’honneur ainsi que Louise Kierans, président du festival de films YoungCuts peuvent être visioner ici. Au cour du festival, des prix seront remis selon différentes catégories : Meilleur Acteur, Meilleure Actrice, Meilleur Montage, Meilleure Cinématographie, Meilleur Film d’Animation, Meilleure Musique Originale, Meilleur Documentaire, Meilleur Court Court, Meilleur Film Québécois, Meilleur Film Adolescent, Meilleur Réalisateur, Meilleur Film ainsi que le Prix Tribute.ca. Trois films en compétition ont déjà gagné les honneurs de festivals de films. Dreams Beyond the Borders de Jessica Szeto, gagnante du concours Children’s Frame It to Change It; Electric Rivers d’Esteban Vargas a remporter le concours Montreal Fringe 500 et Vigilante de Mitchell Arend, qui a gagné le vote du publique lors du Repêchage YoungCuts. Fondé en 2001 sous le nom de Toronto International Teen Film Festival, YoungCuts a revisité son approche en 2004 pour étendre son registre au cinéastes de 25 ans et moins et a déménager à Montréal pour accroitre sa sélection de films francophones et de langues étrangères. Cette année marque la septième édition du festival. Le festival de films YoungCuts est présenté par Myfilmmaker.com et commandité par Tribute, En Primeur, High Fidelity HDTV, Virgin Radio 96, ICI et Mirror. CE QUE LA PRESSE EN DIT! Venez voir le futur du cinéma! The New MyFilmmaker.com Talent Marketplace connects the best North American filmmaking talent with corporate clients and individuals who want to produce attention-grabbing, affordable video and film. If you need a film - you can be a Film Producer! -MyFilmmaker.com does the work for you, finding you the best available filmmaking talent for FREE. -If you have ever wondered where to find people that can make outstanding quality video at the best prices, MyFilmmaker.com is where it happens. -One of the best ways to ensure that you pay a competitive market price. -Your identity is only made known to the three filmmakers that bid on your project, protecting your identity. -Find pre-screened filmmaking talent - anywhere in North America and FAST! -The MyFilmmaker.com Five Star Plan provides simple systems and processes that reduce time-wasting administration and make sure that you get what you want. -Make more money working on film projects and less time looking for them. -Learn about commercial opportunities immediately. New projects sent to your e-mail. -Don’t chase clients to get paid for excellent work. -Access to MyFilmmaker.com production and administrative expertise. -Easy Sourcing of filmmaking talent for your own projects. MyFilmmaker.com also offers to Film Producers and qualified Filmmakers a Five Star Plan that reduces administrative headaches and helps fast track production with standard contracts, invoices, payment processing, a dispute resolution service and a buyer satisfaction guarantee. If your film was selected to be shown at the YoungCuts Film Festival this is a good indication your work will be approved. Myfilmmakers.com is a new division of YoungCuts Inc. It expands and automates our efforts to connect talented filmmakers with producers and projects based on everything that we have learned over the past five years. Unlike the YoungCuts Film Festival, there are no age restrictions ( you do have to be older than eighteen years!) and there is no requirement to have previously participated in the YoungCuts Film Festival – we are simply seeking the best filmmakers that want to work professionally. The basic principle of MyFilmmaker.com is that corporations, charities, small businesses and individuals looking for filmmaking talent will go to the site and enter the details of their project. Key details will be sent to approved filmmakers in the appropriate geographical area and up to three filmmakers will pay a small lead purchase fee to get complete details and submit a project bid. The Film Producer will then choose a filmmaker to work on the project. Since 2004, we have been working with great filmmaking talent to produce film and video for corporate clients like Pepsi, Air Canada, Astral Media and High Fidelity HDTV. MyFilmmaker.com is a natural extension of this work and permits us to connect the filmmakers directly with people that want to produce video and film. I am the Festival Director for the YoungCuts Film Festival; the head writer/publicist/SHILL~ for the International Wrestling Syndicate; and the Commissioner and Worst Ring Announcer in the Multiverse for Inter-Species Wrestling.